While on a holiday in Bangkok a few years ago I had the opportunity to tase the most amazingly fragnant and delicious tom yam soup.I don’t know the exact ingredients that go in but it looked like a mess and tasted like heaven. A few things that went into the soup were mushrooms, lemon grass, prawns and lots of different Thai herbs and vegetables. Due to the lack of halal food we had to make do with drinking this alomost everyday. No complaints there. So, this weekend we visited Benjarong, a Thai resataurant in Alwarpet. Yes, I know its been there for a long time but I never got to go. The decor is very subtle with a lot of Thai influences. There was a sleeping Buddha here and a dragon there. Lots of whiny Thai music too. Near the entrance one chinky looking girl in a traditional kimono type dress was sitting on a little dais peeling and carving carrots. For all the scene they put I thought the food would be bad. How wrong I was! Samma yummy it was! I wanted to take pictures but the glutton inside me didn’t want to wait. I did manage to overcome that and click three photos. 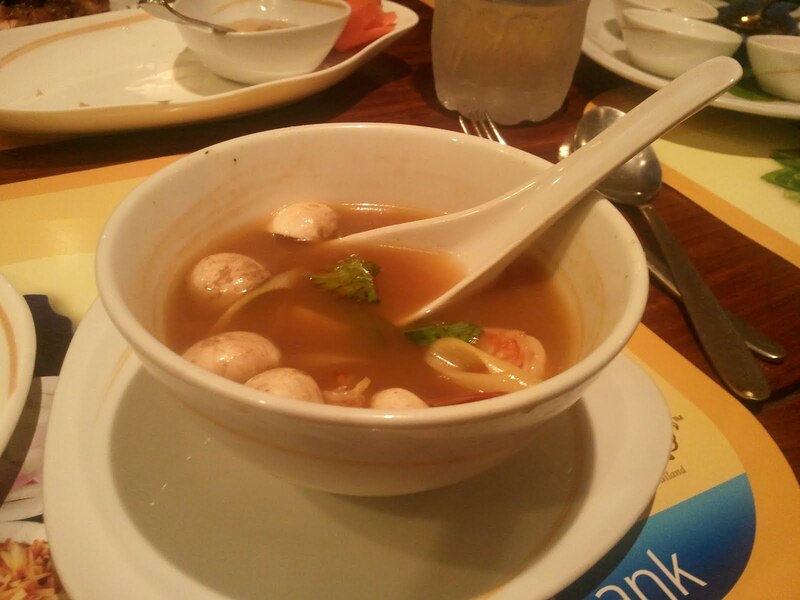 For starters we had tom yam soup. Super yummy it was. But thanks to all the kaaram, full nasal leakage only. We also had kimono wrapped prawns. Cute, I know. It tasted even better. The lamb something crispy was to die for! 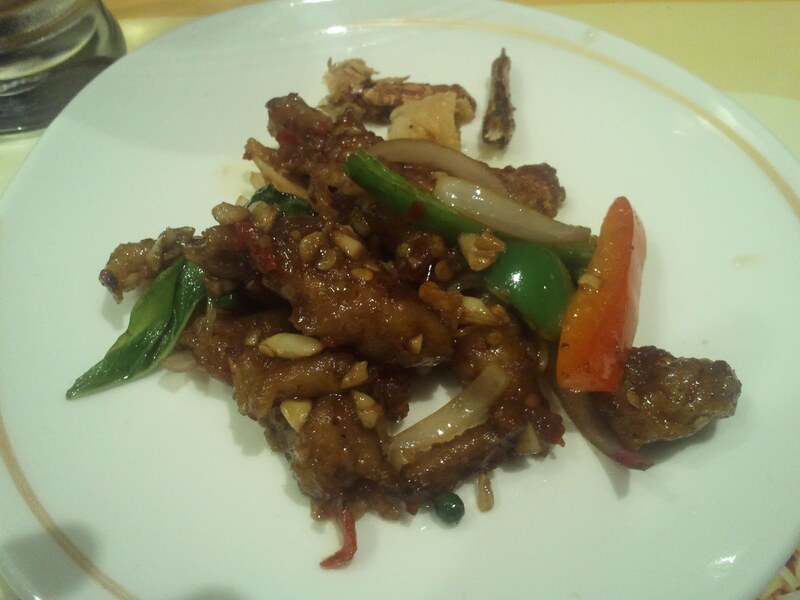 It was fried oh-so-gently with peppercorns and was crispy and soft at the same time. Main course was rice noodles, Thai red curry and white rice. 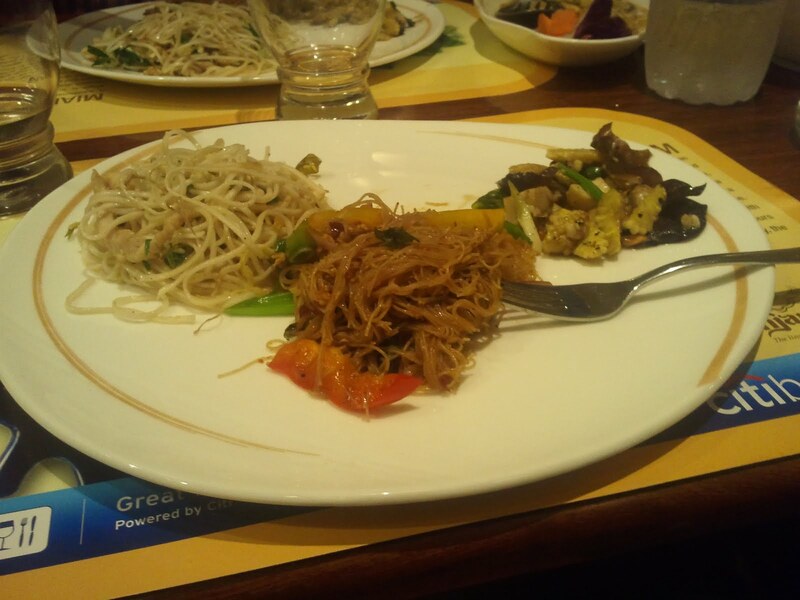 Thai cuisine is mainly know for the aromatic herbs and spices used. It is also known to incorporate the balance of the five fundamental tastes in each dish : kaaram, pulippu, inipu, upu and kasappu. Benjarong amalgamates all this perfectly and forms one beautifully presented meal that is sure to leave your taste buds begging for more, although your stomach will burst from the excess food. Location : TTK Road, Alwarpet, Chennai. It is right opposite the road that leads to Samco Malaysian restaurant. It is a one way road. Do not go in the opposite and direction and get stuck like my brother did.